The U.S. Food and Drug Administration issued an alert for counterfeit BiCNU, an FDA approved cancer drug. 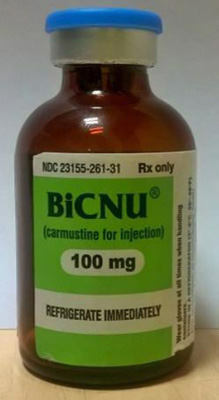 Also known as carmustine, BiCNU is an injectable medication used to treat brain cancer, multiple myeloma, and lymphoma (Hodgkin’s and non-Hodgkin’s). Although there is no known incidents of counterfeit BiCNU being administered to patients in the United States, the FDA reports 100 mg carmustine has been found in other countries. The FDA approved drug is manufactured by Emcure Pharmaceuticals and distributed in the U.S. by Heritage Pharmaceuticals. In our opinion, Emcure has a horrible safety and corporate integrity record. The FDA has previously found serious violations in Emcure’s offshore pharmaceutical plants. While there is no evidence that any of the counterfeit drugs were made by Emcure or distributed by Heritage, we worry that same company that is distributing the counterfeit product may have also supplied the API to Emcure. According to the FDA, real BiCNU vials have a blue flip top and have an NDC number that ends in 31. The counterfeit has a gray flip top and and an NDC number ending with the numbers 41. Recently we saw a U.S. oncologist prosecuted under the federal False Claims Act for purchasing and distributing counterfeit cancer drugs. The physician allegedly purchased the product from an unlicensed supplier in the U.K. but then billed Medicare for the regular cost of the drug. Physicians who are knowingly supplying unapproved or counterfeit cancer or other medications can be prosecuted under the False Claims Act. That law also allows private individuals to bring cases and receive an award from the government. Awards range between 15% and 30% of what the government collects from wrongdoers. We suspect that defective and counterfeit BiCNU drugs are already in the United States. Our goal is to stop these drugs as soon as possible before someone is harmed. We also wish to help the insiders (whistleblowers) who come forward. Your information is always confidential. (We don’t accept any funding from big Pharma). If you know of bad products being distributed let us know immediately. We will make sure that your information is expedited by the FDA and can help you find the best lawyer if you are interested in collecting a whistleblower award. There is never a fee or charge for our services.